A ban on pavement parking and introducing 20mph limits on local streets are among measures recommended in a new manifesto published by an alliance of cycling and walking organisations. Betweem them, the Bicycle Association, Cycling UK, the Ramblers, British Cycling, Living Streets and Sustrans have a combined membership of more than 330,000 people and span every form of walking and cycling, from the school run to Olympic success. Launching the ‘Moving the Nation’ manifesto on 28 June, the partners are calling for a future where everybody in the UK can live, work and play in places that are ‘healthy, vibrant and that make walking and cycling the natural choice for short journeys’. Focussing on five areas, the manifesto calls for a ban on pavement parking, high quality cycling infrastructure, a 20mph limit on local streets and an overhaul of the Highway Code. The manifesto also urges the Government to provide cycle training for all children during their primary and secondary school years, and to embed a culture of walking and cycling throughout the school curriculum. 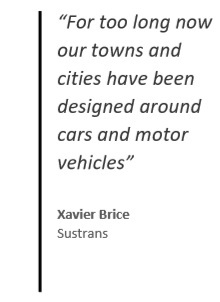 Xavier Brice, chief executive of Sustrans, said: “For too long now our towns and cities have been designed around cars and motor vehicles, leaving them unsafe, unattractive and difficult to move around on foot or by bike. Chris Boardman, Greater Manchester’s walking and cycling commissioner, said: “Getting around on foot or by bike has a transformational effect on our local neighbourhoods but also on our collective health and wellbeing. “In spite of this, consistently across several Governments, we’ve seen a lack of leadership and far too little investment in new infrastructure to make it safe and easy to do. Julie Harrington, chief executive of British Cycling, said: “More people cycling and walking will reduce congestion, lower the costs of ill health on the NHS, and make our local communities safer and more pleasant places to be. Perhaps the real truth is that the cycling fraternity would wish to see an end to such parking as it would then free up more pavements and make them available for them to cycle on. Just a thought. I have lived on a street full of terraced houses with absolutely no garages or back so they all park partly on the pavement and its caused no problems at all. Everyone tolerates it as being necessary and understandable and all vehicles that travel that street have been able to. As for the alliance with the 20 is plenty scheme, they will do anything to promote their ideas and as yet after more than 12 years of pushing out the scheme there doesn’t appear to be absolute evidence that it works. We have suffered many fluffed and fogged intermediate reports from interested parties but as yet really nothing from any independent organisation or authority. It now appears that some local authorities are reporting some negativity with regards to its worthiness of purpose as the end results have not yet born out the results. If someone has spent the time and effort to plan, raise funds and build a cycle path for your convenience and safety then the least you can do is use it at all times and take the time and cross twice. I take it you’re not racing but enjoying the riding with friends, as you say look across the North Sea. I don’t think any of those possible reasons apply here Paul as it is used by cyclists, but definitely not by all, which was my point- some still preferring to ride on the main c/way. It’s on the south west side of the A540, Telegraph Road, Wirral, extending north westwards for just over a mile, from its junction with Oldfield Drive to Thursaston Road. This track is certainly well used so good infrastructure works. Not far from me, there is a cycle lane a few metres away from and parallel to, a high speed ‘A’ road over a distance of couple of miles or so and yet I still see cyclists using the A road c/way and not the quieter, safer, cycle path. Anybody any ideas why that is? Kris; I don’t see anything about shared use in the manifesto. High quality cycling infrastructure should avoid conflict with pedestrians. Pat; people are lazy. If cycling and walking are the easiest way that is what will happen. If making the desire line pleasant for active travel requires re-routing cars so much the stronger inducement. Look across the North Sea. Yes all good stuff but once again the inherent conflict between pedestrians and cyclists is ducked. The road safety community really need to grasp this issue and be more open about priorities and trade-offs especially in shared use design. Tens of Millions have already been spent on improvements to walking and cycling infrastructure . More tens of Millions are earmarked to be spent and that is great. The government are already reviewing the blight of pavement parking and hopefully changes will be coming to put some order into the chaos. The expansion of more evidence based 20mph speed limits continues apace and that is welcomed (but “say no” to default 20s). We know walking and cycling are good for us but despite all this I don’t see where the manifesto is really getting to grips with changing the mindset of “those who could do but don’t”. Seems to be a major blindspot in the campaigner’s vision. Come on campaigners it’s time for YOU to directly address the really big issue of “people don’t want to” outside of your supporter base regardless of the infrastructure improvements going on. As the old saying goes: You can take a horse to water but you can’t make it drink.